This is the main message from the Samoa Cancer Society as the whole world dedicates the month of October to raising and creating awareness to help fight against cancer. 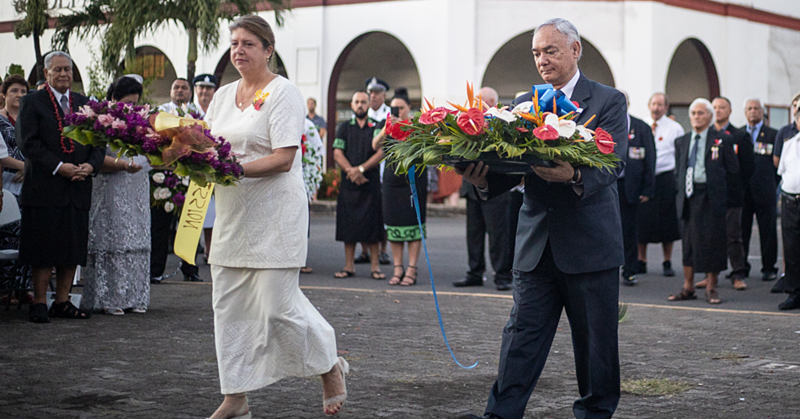 In Samoa, the Pinktober week was officially opened in the early hours of Monday morning at the ANZ bank’s main office. 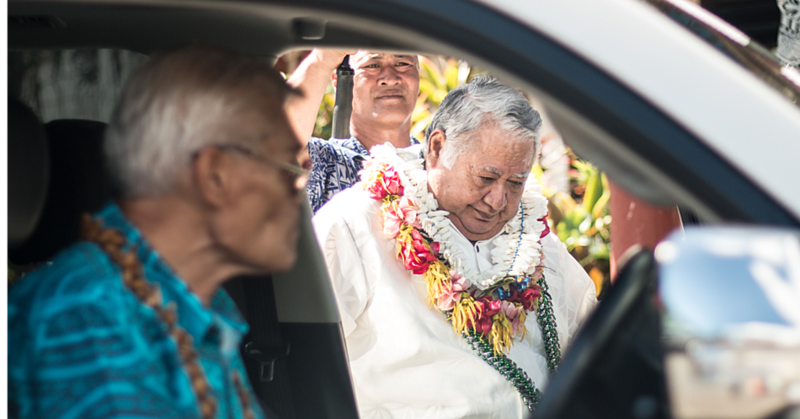 The event was officially launched by the Minister of Health, who is also the Patron of the Samoa Cancer Society, Tuitama Dr. Leao Tuitama. Also present at the event were the Coach and management and the whole Toa Samoa team in pink supporting the event. Kristina Best, the Vice President of the Samoa Cancer Society addressed the audience and spoke about the importance of this month. Kristina went on to say that Pinktober is not just a marketing tool. Instead, it does open up a conversation about breast cancer. “It gives us the opportunity to think about women and men who are still being diagnosed with this disease and that we are vulnerable to it. “I am sure that I am not wrong in stating that many of us here have had a close relative or friend who suffered from some form of cancer. “So during Pinktober in Samoa, we think about our loved ones who are living with cancer. We also remember those who have suffered, those who survived, and those who we have lost. It is also important to know that cancer does not have to be a death sentence. “The S.C.S’s main message we are trying to deliver this month is that early detection gives us the chance to combat the illness, which means that we can deal with the problem sooner, rather than later. Education and awareness, allows us to look for solutions and possible preventative methods. Finally, Kristina added that Pinktober in Samoa symbolizes hope and they are also hoping that we can all work together as a community to fight against cancer. Tuitama Dr. Leao Tuitama, addressed the audience and also spoke about the importance of early detection and cure to prevent people from suffering from cancer. He also thanked the participation of male and in particular the Toa Samoa team and management for their support. “Breast cancer is not a gender issue,” said Tuitama. “Breast cancer can happen to women and men. There have been a lot of men who suffered from this illness. 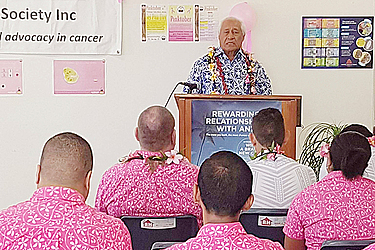 This month is dedicated to raising awareness and campaigns on how to prevent breast cancer, said Tuitama. Early detection is very important, he added. “The importance of early detection and treatment, and palliative care is what we are trying to convey. “While most people are aware of breast cancer, many people forget to have a plan to detect the disease in its early stages and encourage others to do the same. Prevention is always better than cure. He went on to say that currently there is no sufficient knowledge on the causes of breast cancer. “Therefore, early detection of the disease remains the cornerstone of breast cancer control. “When breast cancer is detected early, and if adequate diagnoses and treatment available, there will be a good chance that breast cancer can be cured. “If detected late however, curative treatment is often no longer an option. In such cases, palliative care is much needed to relieve the suffering of patients and families. Today, in honor of Pinktober month, the Samoa Cancer Society is hosting a Pink Luncheon at Scalinis Restaurant. There will be items up for auction. The Pink Luncheon will start today from 11:30am to 1:30pm. Today is also the Sei Pua day, dedicated to all our loved ones who are suffering from cancer, and to those who have lost their battles to cancer as well.